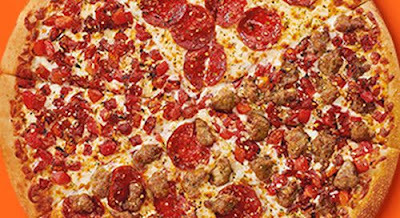 Little Caesars is testing a new pizza featuring a four different topping combinations, one for each quarter of the pizza. They're calling it the "Quattro Italian" and it's described as "a unique large pizza with a collection of classic Italian flavors, sprinkled with garlic-herb seasoning." The Quattro Italian is selling for $8 each (Hot-N-Ready from 4 PM to 8 PM) in the Tulsa, OK area.